I have a 2000 maxima se auto. The car has 287k mi. It recently has gotten to where it stalls when i shut the drivers door and it won't restart if the door is closed. It will only run with the drivers door opened. The alarm also goes off randomly if i lock all the doors. It seems to be some sort of electrical issue. I put a new battery in it yesterday, thinking that it may have something to do with it. The old battery tested bad. The car runs fine otherwise. Any help on what to check would be appreciated. Pretty bizarre. No idea how that could affect engine (door is connected to BCM) lol. I'd bypass the door switch and see what happens. That'll fix the alarm randomly going off, too. If it doesn't, then unplug the hood sensor as well. thanks for the respone. I'll give it a shot. It's almost like something is shorting out. I agree, but I wonder how that affects ECU and why a fuse isn't blowing, since you can replicate the issue over and over. i bought this car last summer. It was a repo. After i started cleaning it out, i found a mouse nest in the trunk and a dead mouse in the blower cage. There is no telling what the little mouse bit into. The car also has a remanned ecu. Apparantly it had a p0505 at one time, because the pigtail going to the idle controls had it's wires soldiered together as if it had another connecter put in. It's not my main car so i don't drive it much. This may take some time to figure out. You've got a bad ground somewhere. With the door open and the car running, depress the door plunger switch manually ... does the car stall? yes it does, and it's only the drivers door switch that it does it on. Damn. Human and vermin induced gremlins. Something is telling the alarm to arm. Even if the door switch was messed up the alarm has to be killing the engine. It couldn't if it wasn't armed. It seems that could be the ecu or NATS. Maybe when the ecu was replaced the nats system didn't sync properly? So I've sortof figured out after a week of heavy rain that the problem is due to water getting under the dash on the drivers side. I've also been monitoring the battery voltage. 2 weeks ago my battery voltage was at 12.4v, last week it had dropped to 12.1v. I checked it this morning and it was at 1.68v. 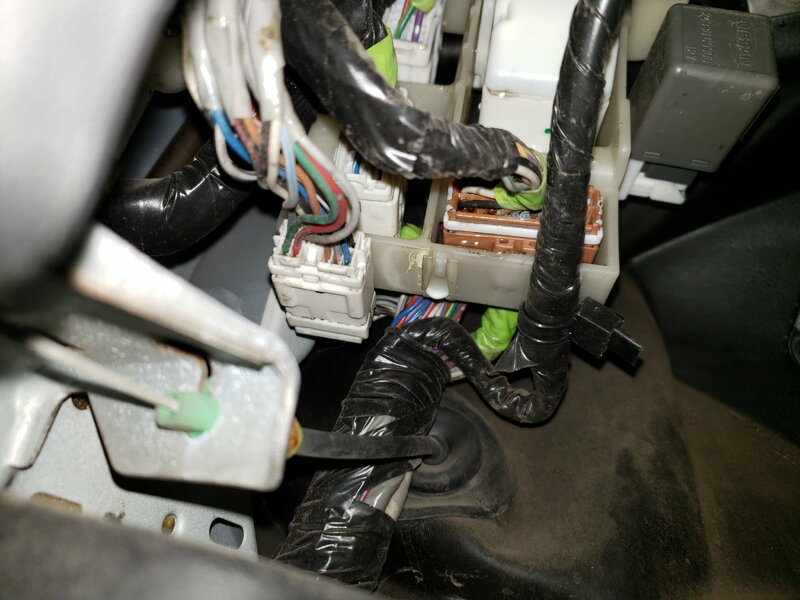 My guess is that water is getting into the connectors under the dash and causing shorts/grounds in the wiring, which is what is casing the weird issue of "car won't run unless door is opened." I guess my next step will be to find the leak. I'm guessing it's either the sunroof or coming in around the cowl. There's a spot around the wiper arm that had given people problems. I've read about it. 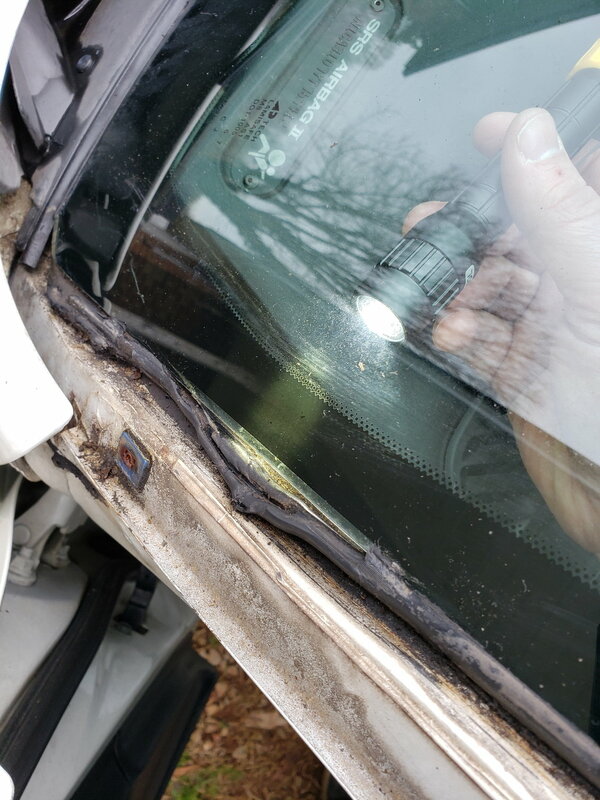 There's really only one way for the sunroof to leak around the dash and that's only if the drain tube is clooged/cracked which isn't likely. If it clogged at the opening it would leak around the the glass itself. I had a big sunroof issue last year. Learned some things. I doubt that's your source of water. I wasn't aware of the wiper arm issue. I'll look around for some threads on it. The sunroof drains seem to be ok. Looking under the dash on the driver side, I can see that there is water in the plugs behind the fuse box. Found the leak. It was an improperly installed winshield. Hopefully fixing this will fix the weird electrical issue I have. I will report back to this thread with an update in a few months. Yikes. That makes sense. It's a lot more serious than a simple 1 wire short. It takes a very special person to mess that install up. Last edited by Child_uv_KoRn; 03-02-2019 at 06:27 PM. it was leaking down on I guess what is known as the super multiple junction. I believe I have the leak stopped. I used Permatex flowable silicone for windshields. I don't see any more leaks after the rain yesterday. I just hope that the wiring and everything is ok. I'm going to let the car sit for a while to make sure everything is dried out before reinstalling the battery. Engine Shutting Off in the morning!